At the foot of Mount Qingcheng in Dujiangyan, Sichuan province, a Chinese keeper speaks to giant panda Tai Shan in its den. They are using English to communicate. The 9-year-old male panda charmed millions of Americans during his stay at the Smithsonian's National Zoo in Washington DC for four and a half years. 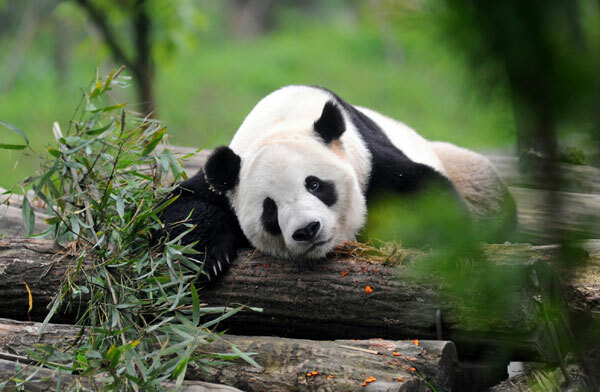 Since his return to China in February 2010, Tai Shan has lived in the two bases of the China Conservation and Research Center for the Giant Panda. The center designated a keeper who is proficient in English to take care of Tai Shan because his US keeper Nicole Meese had communicated with him when he was just 1 month old. Tai Shan has not yet learned the southwestern Sichuan dialect. "Tai Shan is one of the center's nine pandas born overseas and returned to the base," said Wang Yongyao, an official with the administrative bureau of the Wolong National Nature Reserve, which oversees the center. The male bear is one of a special group of China's giant pandas that have to adapt back home after being born overseas. The center is the world's largest giant panda conservation and research organization. It started loaning pandas to other countries and regions in 1996. Its pandas have given birth to a total of 12 cubs overseas since. Under an agreement for global giant panda preservation, giant pandas born overseas belong to China and must be returned to the country after they turn 2. China agreed to extend Tai Shan's loan to the US because of the bear's huge popularity there. A pair of adult pandas can also be loaned overseas for 10 years under an agreement between China and the host. "Everyone loves pandas and they are like citizens and residents of their host country or region. China is also often asked to extend the loan of the bears," said Zhang Hemin, chief of the administrative bureau of the Wolong National Nature Reserve. "As a result, only their cubs born overseas have returned home." Of the 12 cubs born overseas, only three aged under 2 have yet to return home. The other nine bears live in the Dujiangyan and Ya'an bases in Sichuan. Giant pandas born overseas learn to adapt back in China in Sichuan province.